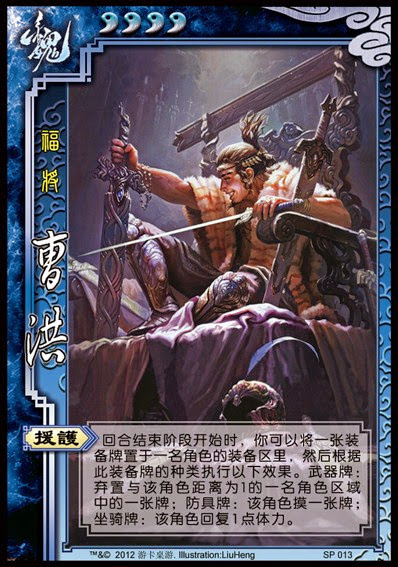 Weapon: Cao Hong selects one card of a character in the target's range and discards it. Armor: The target draws one card. Horse: The target recovers one unit of health. "Intervene" is activated after Cao Hong's discard phase. Cao Hong can place pieces of equipment into his equipment area via "Intervene" and enjoy the benefit of the power. However, he cannot take one of his equipped cards and 're-equip' it on himself, as this violates the requirement that the piece of equipment is placed into an unoccupied spot in a character's equipment area. He must equip equipment cards from his hand into his equipment area to enjoy the benefit of the ability. When Cao Hong places a weapon in another character's equipment area via "Intervene," he cannot discard one of their cards - he can only discard a card of a character in their range. When Cao Hong discards a card by equipping a weapon via "Intervene," he can choose to discard a hand card, an equipped card, or a pending tool card. Cao Hong is a useful support character. "Intervene" can be used to bolster the offense/defense of a character while enjoying an additional benefit. "Intervene" can be used twice per piece of equipment, as Cao Hong can use the ability on himself (from his hand to his equipment area) on one turn then place the piece of equipment on an ally during the next turn (from his equipment area to another character's equipment area). Compared to other characters that can relocate equipment (Zhang He, Wu Guo Tai, Zhang Zhao & Zhang Hong), Cao Hong is quite weak. Only about 15% of the deck is equipment, and these other characters have abilities that can be activated without the use of equipment. Cao Hong needs a team to be effective. Without a team, Cao Hong can only use "Intervene" on himself. Also, since equipment is a small fraction of the deck, he needs characters to help him acquire equipment. Liu Bei/Guo Jia - These characters can give Cao Hong equipment for "Intervene." Wu Guo Tai/Zhang He/Zhang Zhao & Zhang Hong - These characters can relocate equipment to Cao Hong's equipment area and make it easier to use "Aid and Protect." However, it should be noted that Wu Guo Tai and Zhang He can remove equipment from Cao Hong's equipment area with their abilities, giving them leverage over him if they are on the opposite team as they can prevent him from using "Intervene" with the removed equipment on his teammates. Chen Gong - Chen Gong is similar to the group of characters mentioned in the last bullet-point in that they can help Cao Hong, but it is important to note that unlike the previously mentioned characters, Chen Gong can start an infinite loop with Cao Hong. Cao Hong can place a piece of equipment in Chen Gong's equipment area and reap a benefit via "Intervene" during his turn. During Chen Gong's turn, he can use "Brilliant Scheme" to give the piece of equipment back to Cao Hong and allow him to draw a card or attack a character of Chen Gong's choice. Sun Shang Xiang/Ling Tong/New Ling Tong - These characters have abilities that activate when they lose equipment. Although Cao Hong cannot use "Intervene" to remove their equipment, he can give them equipment cards to be removed at a later point in time. Hua Tao/God Zhao Yun - These characters have abilities that allow their equipment to be used for other purposes. Cao Hong can give them equipment to use for these other purposes. Gan Ning/SP Gan Ning - These characters have abilities that allow them to easily remove Cao Hong's equipment, preventing him from using "Intervene" with them on an ally. King The player in the king role must have outstanding offensive and defensive abilities, and Cao Hong's "Intervene" does not fit the bill. There are much better choices. Loyalist Cao Hong is serviceable as a loyalist as he can use "Intervene" to help the king. Rebel Cao Hong is decent as a rebel. "Intervene" can be useful in fortifying himself and his fellow rebels. Spy Cao Hong is a weak spy choice. As stated previously, he needs a team to be effective. The 2012 SP line was discontinued (probably due to poor reception among SGS fans) and the 2011 SP line was continued. As a result, Cao Hong was released as the 13th 2011 SP character. While we are happy that the insane 2012 SP line was discontinued, we are underwhelmed by Cao Hong. It is good that he is not overpowered, but he seems substantially weaker than the rest of the SGS cast. This may be surprising when looking at the 'Notable Combinations' section, but Chen Gong, Zhang He, Wu Guo Tai, and Zhang Zhao & Zhang Hong have equipment-related abilities that are better than "Aid and Protect."